“I think I won a photography award,” I say to the Scottish girl sitting next to me. Her name is Fiona and she is not a photographer, and knows nothing about awards for wedding photographers. However, she is the only person in the room who speaks English and understands that wedding photography is an actual profession (people in India are a bit confused by what I do), so naturally she’s my first choice for sharing the good news. My heart is thumping in my chest as I continue reading the email. It’s not an official email, only a congratulations from another photographer. I scan my inbox looking for something with the headline winner, or congratulations but see nothing. Did I really win? Maybe they made a mistake? I head to the Fearless Photographers Facebook page and scan the latest winner’s images wondering which if any of my images will be there. I’m scrolling and praying that the internet doesn’t go out in this moment or the power or one of many other things that often go wrong in India preventing access to the worldwide web. I’m almost to the bottom and I haven’t seen anything of mine yet. Disappointment begins to well up in my chest, and then there it is, my photo of Erica and Pierce. “I won a Fearless Award!” I practically yell. The hotel attendant looks at me curiously for a brief moment but then proceeds to continue ignoring us. A happy dance, might be a bit much although I get the feeling he is rather used to strange behavior from the foreigners. My heart is back to thumping in my chest and elation sets in. I stick to a mental happy dance. You see, I set this goal to win a Fearless Award in 2014. And I did it. And Fearless Awards are tough to win. And I did it. 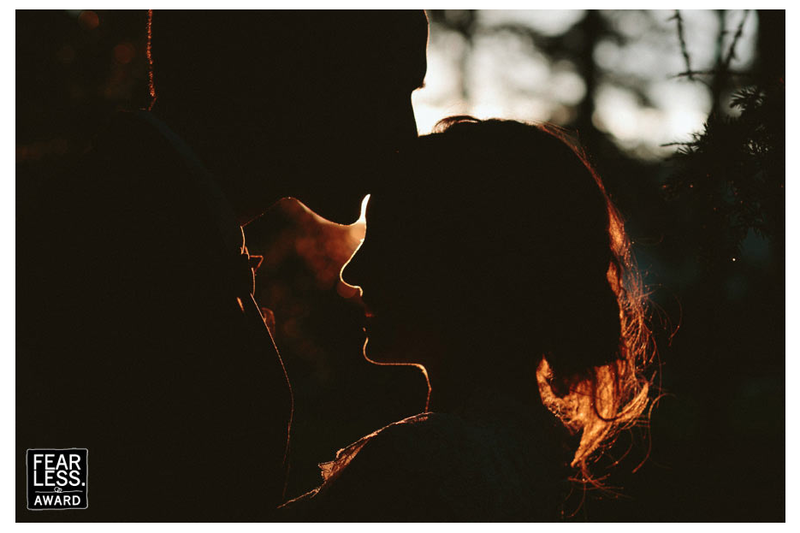 The best part is the image is from Erica and Pierce’s wedding in Paradise Valley, Montana. Last summer is what I call the summer of inopportune weather. For 7 straight weddings, good ol’ Mother Nature reared her pretty/ugly face at just the moment you had planned something marvelous outside. Pierce and Erica’s day was no exception, but we were handsomely rewarded for the inconvenience with an amazing Montana sunset. (Our sunsets are better here). Really, we did it, because even given this crazy beautiful golden fifteen minutes, there is no way I would have received this award if it weren’t for these two and their crazy, head over heels love. So Erica and Pierce, thank you for inviting me into your lives last July, award or no award, I will never forget it. On this Wednesday cheers to reaching high and reaching goals! Keep on dreaming people because you can get there, you really can!